Back to school can be very stressful and exciting at the same time. Unfortunately, stress can sometimes cause more break outs, plus new a schedule can always make your skin turn on you...just when you want to look your best for the 1st days of school...oh life of a student..
To the rescue is Vichy Normaderm new Cleansing Mattifying foam and Normaderm BB Clear Anti-acne unifying Beauty Balm. 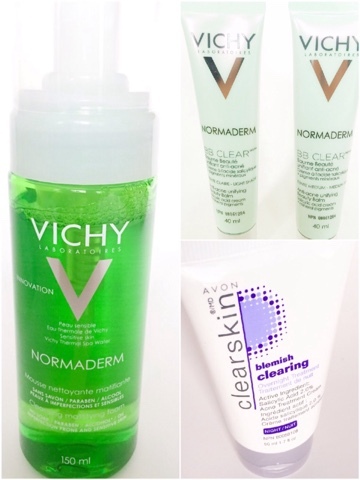 Vichy Normaderm Cleansing Mattifying foam is soap free, paraben free, alcohol free, and it is so gentle that the most sensitive skin can use this without any concerns. Purifying, Antibacterial and keratolytic actions can help open up pores plugged at the surface while providing soothing effects. Take a look at the results of efficacy proven under dermatological control results! 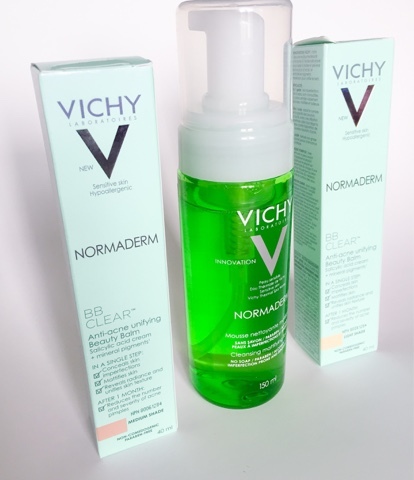 Vichy Normaderm also has introduced the BB CLEAR Anti-acne Unifying Beauty Balm and it will improve the number and severity of acne pimples plus it instantly covers and treats acne. "Salicylic acid + anti-bacterial and sebum-regulating Zinc decongest pores, remove dead skin cells, slow sebum production and stimulate cellular renewal. Week after week, the skin becomes soft, smooth and flawless." Add this Clearskin Overnight treatment "blemish clearing" from Avon to your night routine and see your blemishes clear up!